Originally named The Warlocks, The Grateful Dead made their performance debut in July of 1965 and quickly went on to become the best known and most influential of San Francisco's psychedelic rock pioneers. The group initially consisted of Jerry Garcia (guitar), Bob Weir (guitar), Phil Lesh (bass), Ron "Pigpen" McKernan (keyboards), and Bill Kreutzmann (drums). In 1968 they added percussionist Mickey Hart and keyboardist Tom Constanten to the line-up. The group released its debut LP in 1967. Both the follow-up album, Anthem of the Sun (1968), and the group's third offering, Aoxomoxoa (1969) , were innovative attempts to capture the band's legendary live energy on vinyl. Aoxomoxoa, featuring eight Grateful Dead originals, was produced and arranged by the band. Showcasing the group's rapidly evolving songwriting skills, the album contains such Dead classics as "St. Stephen," "China Cat Sunflower" and "Dupree's Diamond Blues." With music by Garcia and Lesh, the LP's lyrics were penned by poet Robert Hunter, a longtime friend of the band's. Aoxomoxoa also includes some of the Grateful Dead's most daring aural experiments, including the eerie "What's Become Of The Baby," and the haunting "Rosemary" with its phased and filtered vocal layers. 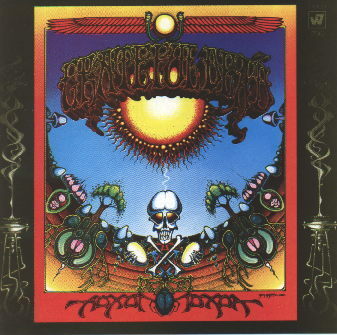 Aoxomoxoa was released on June 20, 1969. The title is a lysergic palindrome by artist Rick Griffin. The original title chosen by the band was Earthquake Country.